The Vikings, those seafaring warriors who terrorized half of Europe during the Middle Ages, were notorious for their ambitious voyages across the Atlantic. They traveled farther west than any European before, colonizing Iceland and Greenland. And it has long been believed that they also reached the northeast coast of North America. The Viking sagas that were passed down over the centuries told the tale of Leif Erikson founding the colony of Vinland in modern-day Newfoundland and Labrador. For many years, though, there was no proof to support this claim. Then, in 1960, the archeological remains of a Norse village were discovered at L’Anse aux Meadows on the Northern tip of Newfoundland. Dating to the year 1000 AD, the dwelling structures that were uncovered at the site strongly resembled dwellings found in other Viking colonies from the same time period. This seems to confirm that the Vikings had in fact reached America 500 years before Columbus. 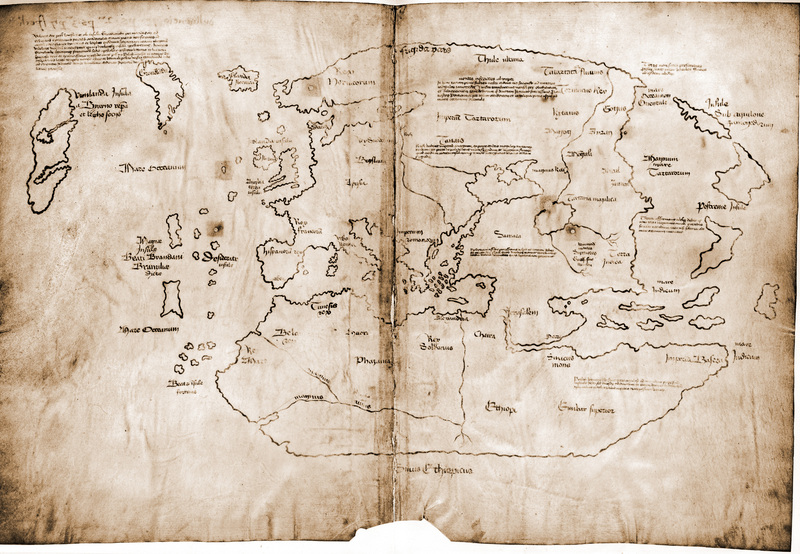 While this site was being excavated, another discovery from a far different source was causing historians to come to the same conclusion: The Vinland Map. It surfaced in 1957 when a London book dealer offered it for sale within a volume of medieval text to the British Museum. They rejected it, and the map eventually wound up at Yale University, where it remains to this day. The first researchers to look upon it were treated to a fascinating view of the world: A pre-columbian depiction of part of the American continent through Viking eyes. It is purportedly a 15th century reproduction of a 13th century original, meaning that it was made after the Vikings founded Vinland, but before Columbus sailed the ocean blue. This cartographic bombshell, however, may be too good to be true. Almost immediately, it began to attract controversy from skeptical scientists. Many chemical analysis has found that the ink used in the map was modern, although some historians have tried to come up with alternative explanations for how the chemicals from modern ink may have gotten into genuine medieval ink. Radiocarbon dating has determined that the parchment itself dates to the mid-15th century, further confusing the matter. Finally, historians have analyzed the content as well, expressing skepticism that Viking explorers from this time period would, for example, draw Greenland as an island, when it had not been completely circumnavigated until the 20th century. The debate rages on and, quite frankly, a lot of the chemical analysis arguments go right over my head. We may never know for certain if this map is a genuine medieval depiction of exploration of America, or just a modern forgery. But the fact that this artifact has generated such extended academic debate over its authenticity just underscores, once again, the historical significance we attribute to maps. For more on the controversy, go here: http://www.webexhibits.org/vinland/? Continuing this year’s goal of looking at maps from a more diverse range of peoples, today I wanted to feature the Micronesian style of cartography. Micronesia is a collection of over 2,000 islands in the South Pacific, covering almost three million square miles of ocean. It was settled thousands of years ago, and came into contact with European explorers in the 16th century. The islands were soon colonized by the European empires, which began importing Western technology to the tribal societies. 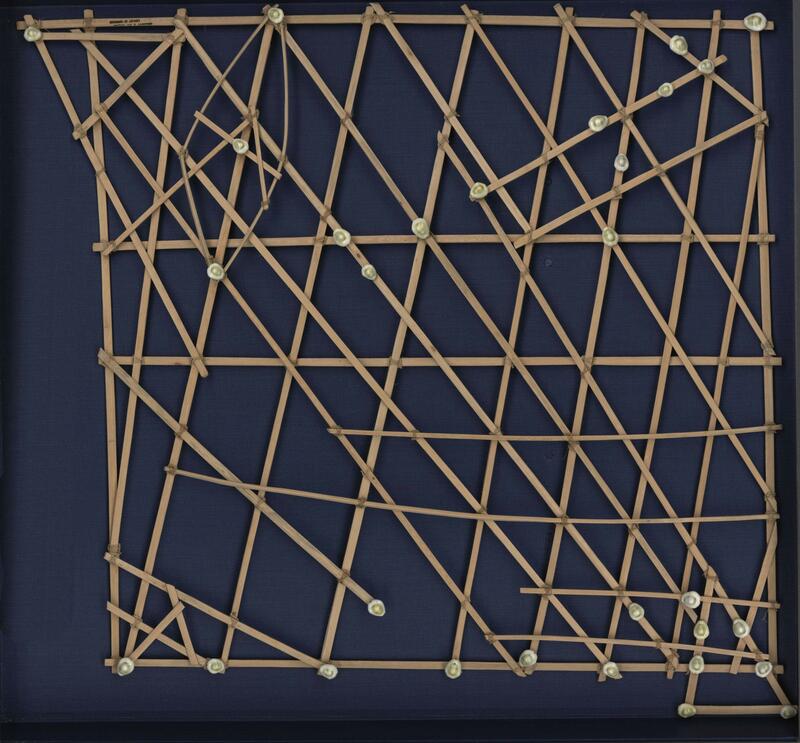 But one piece of technology was already in Micronesia long before the Europeans came: the map. The Micronesian map does not look anything like the Western style of map. It is made of palm fronds and shells, with shells representing islands, and fronds representing the quickest route to sail between two islands. More commonly called stick charts, or rebbillib in Marshallese, these maps were used by sailors to travel from island to island, but not in the way you might think. The sailors were able to study the maps before their trip, commit the routes to memory, and then lay on their backs on the canoe, feeling the swell of the ocean currents in order to measure the distance of their journeys. 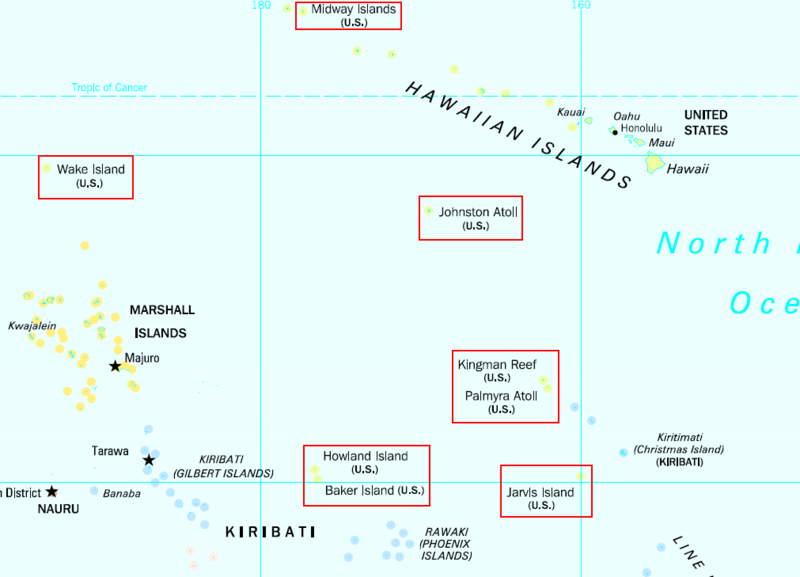 And below, you can see how the stick chart relates to the Western-style map of the Marshall Islands. Just goes to show that maps can come in many forms, and they can all serve a purpose. European explorers may have created rich, elaborate maps, but they often turned out to be full of errors, exaggerations, and mythical beasts. Sometimes the simplest maps work best for getting where you need to go. The legal distinctions between some of these territories can be confusing, but the video does its best to explain. Certain islands, including Puerto Rico and Guam, are considered unincorporated organized territories. In these places, some parts of the US Constitution do not apply, and the residents do not have the right to vote for President. (They can, however, elect a representative to Congress, but the representative cannot vote on any legislation). The unorganized territories, composed of various islands mostly in the Pacific Ocean, have it even worse, though. They have no local government, but also no one living there. Many of these are just tiny stretches of sand that were used for nuclear bomb testing. But the strangest arrangement of all is that of Palmyra Atoll, an uninhabited island which is incorporated, meaning that the entire US Constitution applies there even though the whole island is just a nature preserve. If a non-American citizen gave birth there, for example, the baby would be an American citizen. So the next time you salute the American flag, remember all these other territories that are part of our country, even if they don’t have their own star. Gotham is a dark city with a fierce criminal element lurking beneath the surface (often right on the surface itself). The seediest, most sinister elements of New York and Chicago inspired Gotham’s design and atmosphere, and the Batman films were shot in these cities as well. 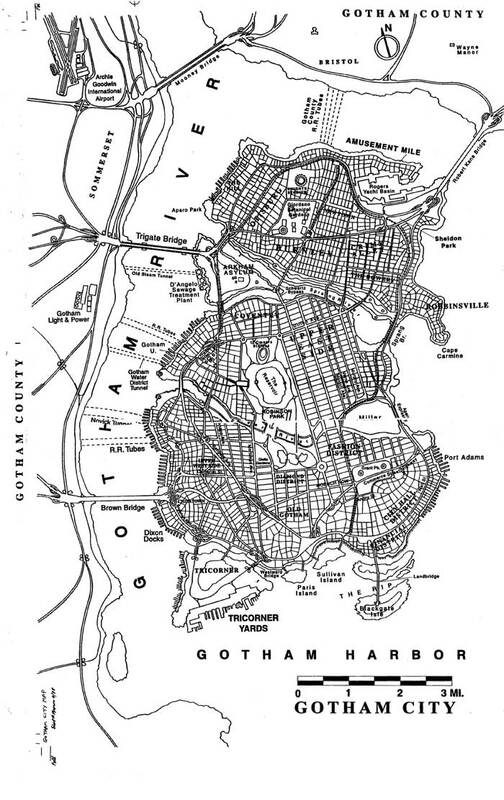 Therefore, Brown wisely chose Manhattan, where he himself grew up, as a template when creating his map of Gotham. Certain elements in Batman storylines (for example, “The Dark Knight Rises”) also indicate that Gotham has to be an island with bridges to the mainland. 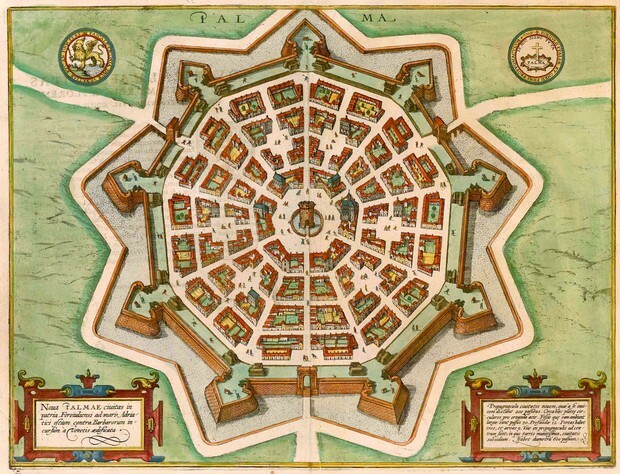 Brown then began sketching out the city, and received a list of place names to insert. Just imagine- the comic books had been running for nearly 6 decades by this point. He had to take every significant location which was mentioned and insert it into the map in a logical place. Anxious fans were waiting to see if he got it right, ready to pounce if a street name seemed misplaced. It must have been a great deal of pressure to be under for the ambitious cartographer. Brown’s map was featured in “No Man’s Land” and would go on to be used in subsequent comics and films. Brown says that he is ultimately pleased with his creation, concluding that he would feel right at home in Gotham. For me personally, I would wait until all those pesky villains had been vanquished before visiting. For those curious, you can find more information about the map at Brown’s website and Batmangothamcity.net. What is it that so intrigues us about worlds of myth and fiction? 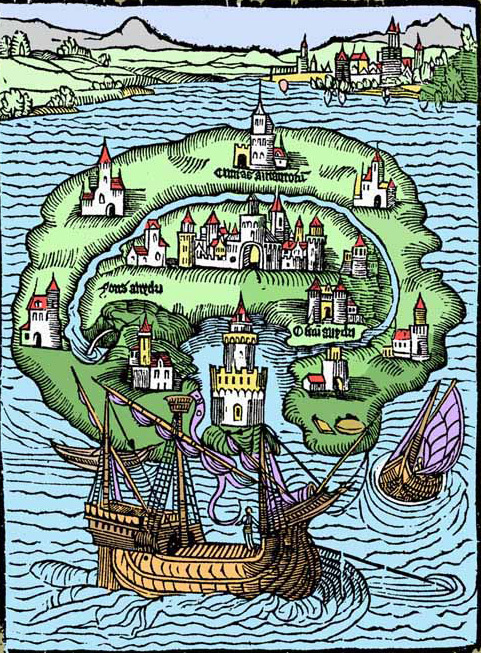 Since at least as far back as antiquity, people have been drawn to imaginary lands, from the island of Atlantis to Lilliput to Westeros. And every year, countless authors are creating more and more fictional worlds, from the fantastical to the mundane. Readers and viewers gleefully jump into these new worlds, returning again and again. Why do we do this? 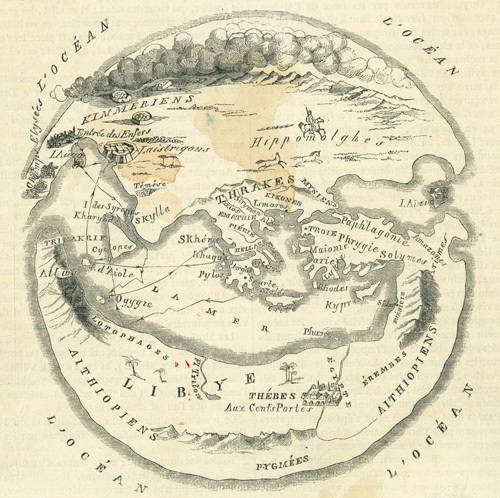 Umberto Eco, in “The Book of Legendary Lands”, seeks to answer this question as he gives an illustrated tour of history’s most interesting lands of fiction and legend. He looks at places inspired by scripture, bizarre locations from science fiction, and utopias dreamt up by idealist philosophers. The book is chock full of colorful maps of these places. The possible world of narrative is the only universe in which we can be absolutely certain about something, and it gives us a very strong sense of truth. The credulous believe that El Dorado and Lemuria exist or existed somewhere or other, and skeptics are convinced that they never existed, but we all know that it is undeniably certain that Superman is Clark Kent and that Dr. Watson was never Nero Wolfe’s right-hand man, while it is equally certain that Anna Karenina died under a train and that she never married Prince Charming. Maria Popova at the site brainpickings.org has put together a splendid summary of the book as well, with more quotations and several examples of the maps from inside. I have included a few of my favorites below. For more information, you can also find the book on Amazon. I may pick it up myself. We recently passed the one year anniversary of the undiscovery of Sandy Island, a sad fate for the phantom island which managed to persist on maps for centuries even though it never existed in the first place. As we’ve seen before with the fictional Mountains of Kong and the Island of California, sometimes false geographical features are reproduced on maps for many years even though they remain unverified. What’s most striking here, though, is the fact that Sandy Island continued to appear on maps into the 21st Century, and even showed up on Google Earth, even though no one had ever seen it. How could such an error have made been made, and repeated again and again? James Cook first put Sandy Island on a map in 1774, and a later whaling ship seemed to verify his false sighting when it spotted floating pumice from an underwater volcano. Subsequent maps of the region included the tiny island with the humble, unassuming name. In 1979, the French Hydraulic Service disproved its existence and removed it from its charts, but it somehow survived on other charts. It even remained on the World Vector Shoreline Database for decades afterwards, and Google added it to Google Earth. A search of the island would show a blank, darkened area of sea. Because of the island’s remote location and small size (15 miles by 3 miles), it was able to escape undiscovery for many years. But in November, 2012, an Australian surveyor ship passed through that area to try to clear up some discrepancies in their charts, and they determined that no such island existed at that location. Once they made this undiscovery, Sandy Island was finally taken off the map by Google and National Geographic, and the cartographers of the digital age all had a little taste of humility. The takeaway: Although there may be no new places to discover on earth, we’re still undiscovering places we used to think existed. Now get out there and prove those old cartographers wrong! One of my favorite book series is the Thursday Next series, by British author Jasper Fforde. It’s pure escapism: witty, suspenseful, and brimming with fantastical elements that require suspension of disbelief. The series takes place in an alternate reality version of Britain in 1985, and the protagonist (Thursday Next) is a literary detective charged with investigating literary crimes, i.e., crimes against books. In this version of reality, people really, really love books, and the main villains are those who seek to alter classic literature forever. But it goes even further; characters from books can be brought to the real world, and vice versa. 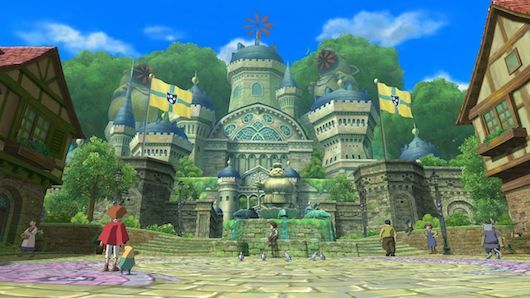 During the series, Thursday learns how to jump into the Bookworld, which is sort of an overworld for all of fiction. Characters from every novel mingle and work together to preserve their individual worlds. Each time a reader opens a book, the characters from that book jump back inside to act out their story. Thursday passes through this world as she investigates crimes and tries to prevent certain stories from being altered, meeting a colorful cast of fictional characters in the process. There have been 7 books written so far, and in the 6th book, One of our Thursdays is Missing, Fforde includes a Map of Fiction Island, which is part of the Bookworld. 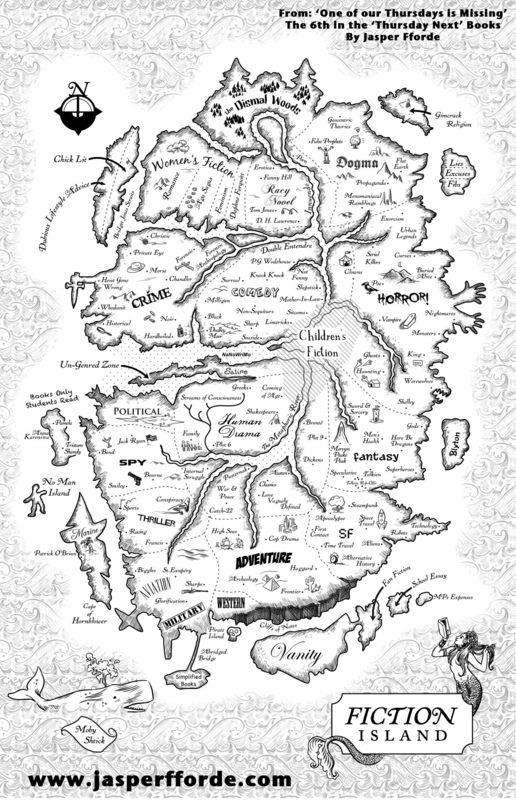 In this map, you can see Fforde’s trademark wit and attention to detail as he charts an island where all fictional genres coexist. 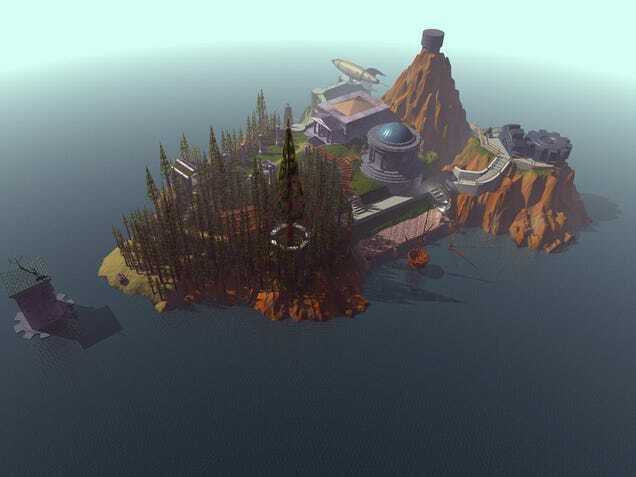 Map of Fiction Island. (From “One of our Thursdays is Missing”, by Jasper Fforde, copyright 2011. I think he’s done a pretty good job of mapping all the literary genres, which is no easy feat considering the blurred lines between some of them. Sci Fi blends into Fantasy, which then leads to Horror. How does one tell the difference between some of these? Horror includes many fantastical elements, such as werewolves and vampires, but it generally follows a vastly different mood from fantasy. Spy novels and political novels are also similar in many ways, but the heroic, independent figure at the center is what makes something a spy novel. Some of the little touches on the map are great, like the hand holding a knife jutting out from the Crime region, and the hands either struggling to escape or attempting to strangle a victim from the Horror region. I also like the little bit of subtle social commentary at the bottom, moving from Vanity Island, to Fan Fiction, to School Essay, to MPs Expenses. Replace “MP” with congressman or senator, and it makes more sense to American ears. Setting a world in an alternate reality where literature is of primary importance, and the world of literature is alive and accessible, opens up the series to nearly endless possibilities. Thursday Next is one of my inspirations in writing my novel, Map of Daggers. In that world, maps are of primary importance, and people communicate more through maps rather than written words. The most talented cartographer is the most popular, celebrated man in the kingdom. And a certain mysterious map provides insights into hidden truths. In our world, most people don’t seem to place much interest in literature or maps for their own sake. So for those of us who do enjoy such things, it is refreshing to jump into a fictional world that shares our passion.